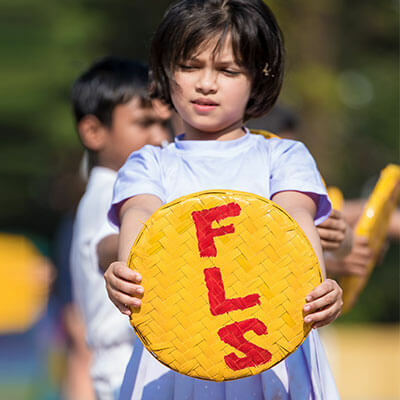 The Management of Father LeBlond School extends the opportunity of availing quality education for an all-round development to the interested and aspiring students of the locality and neighbouring areas. Limited number of seats is offered to the students of the locality and of the nearby places as Day-Boarders. Day-Boarders will be entitled to avail the facilities offered by the school after the normal class-hours and will compulsorily participate in the LeBlond Activity Programme (L.A.P. ), Games & Sports, Remedial classes and/or Prep classes as per the Daily Schedule and School Calendar. Every student is expected to ensure high standard of morality and discipline in the school. The students will attend school in their school uniform regularly which should be clean and tidy, as suggested for boys and girls with polished black shoes and school socks. White P.T. shoes with white socks will be used during games and P.Y classes. ATTENDANCE : A latecomer will not be permitted to attend school. Leave of absence may be granted for valid reasons only. Leave letter must be written and duly signed by the Parents/Guardians and to be submitted to the Class Teacher. Minimum 85% attendance per term is required. If a student remains absent for more than a month without prior intimation and without approval of the School Authorities her/his name will be struck off the School Rolls. In such a case, re-admission with the proper fee will be required for joining the school after long absence. No leave will be granted during Examination/Unit Tests and School Programme. Students will bring the School Diary everyday to the school and parents are requested to see the Diary for updated information, if any and sign thereafter. Parents are requested to read the School Prospectus and Diary carefully to become aware of the School rules and regulations. Parents are expected to apprise the students of the same in order to ensure discipline. Students are not permitted to meet any visitor including Parents/Guardians during School-hours without prior permission from the School Authorities. Parents/Guardians are requested not to disturb the teachers or instructional programme inside or outside the school. The Identity Card must be produced to collect a student from the School during school hours or during dispersal. In no case, a student will be allowed to go home without her/his parent during school hours. Students are expected to be careful about the school property. Any damage caused must be replaced and in addition a Fine will be imposed. Day-Boarding students are NOT permitted to visit or enter the dormitories under any circumstances. Each student will be provided with a School Photo-Identity Card. The Day-Boarders must carry their Photo-Identity card during School Hours. THIS IS COMPULSORY. Parents/Guardians collecting a student from the school will also be provided with an identity card, which must be produced while collecting the child concerned. Students availing the facility of School Transport will be under the care of the transport operator during dispersal with the Identity Card of each pupil. Parents/Guardians are to collect their ward from the pick-up/drop point by producing their copy of the Students Identity Card. THIS IS COMPULSORY. Parents/Guardians of the Day-Boarders may meet the Director/Principal and the Teachers on all working days under PRIOR APPOINTMENT between 10:30 a.m. and 11:30 a.m. or as permitted by the Director/Principal. Attendance of Parents/Guardians is compulsory at all the Parent-Teacher Meetings as calendared and/or as may be notified from time to time. NO PRIVATE TUITION BY SCHOOL TEACHERS: Parents/Guardians are strictly forbidden to approach the School Teachers for Private Tuition. OPTION FOR CHANGE OF WING : If the parents so desire, a Day-Boarder may opt for the Boarding Wing subject to the discretion of the School Management and payment of appropriate fee.